The playlist Robin Rose has assembled for his solo exhibit “The Big Payback” is nothing like the soundtrack I’d make for it. The titles of his abstract paintings reference Jimi Hendrix, Tom Waits, John McLaughlin, and others, all of them gods of rock, jazz, soul, or their fusions. With the paintings themselves, however, Rose is working more angularly, summoning—to my mind, anyway—deliberate art-punk acts like Slint, Shellac, and Fugazi. The paintings, after all, are so much more carefully wrought than many of the songs to which Rose pays homage. The artist works in encaustic, a method that involves adding pigment to heated beeswax and applying it, in this case, to canvas. 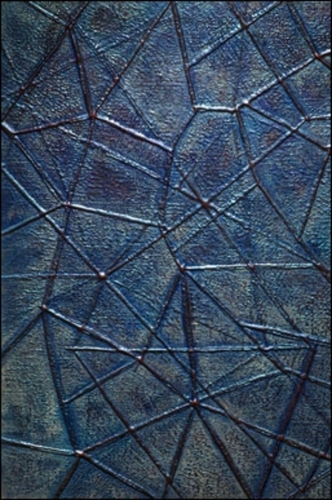 The technique is thousands of years old, though there’s ample room for its use in a modern context; Jasper Johns employed encaustic to achieve the textured surfaces that marked his American flag paintings and other iconic works. Of course, Rose revels in the disconnect—that’s apparent from the paintings themselves. On the one hand, the scent of beeswax fills the gallery; encaustic, generally speaking, makes for a soft surface. But for paintings like “Sapphire Bullets of Pure Love,” Rose has treated the surface so that it appears to be brushed chrome. And he’s attached all of the paintings to aluminum hexcel panels—custom, NASA-grade materials that help give the exhibit a clinical feel. Rose’s use of pointed neon colors also helps juxtapose organic and inorganic. Rose’s painting “I’m So Lonesome I Could Cry” doesn’t evoke any hip-shaking R&B or sadsack country, but the sweeping ripple of magenta across silver does summon Gerhard Richter. Whoever Rose may name as his influences, from Jerry Lee Lewis to Aretha Franklin, his work belongs squarely to a cooler, more restrained, more technical tradition. He seems to know it—why else use encaustic to make paintings that look like brushed metal and hang on metal backing frames? Rose is at his best with works like “Natural Woman,” which makes use of organic ripples running through a neon background. If he were a musician, he’d be the kind of artist who takes traditional rock instruments and makes them sound like they’re being played by scientists. In terms of musical production, Rose may love the live performance, but his work is all studio album.